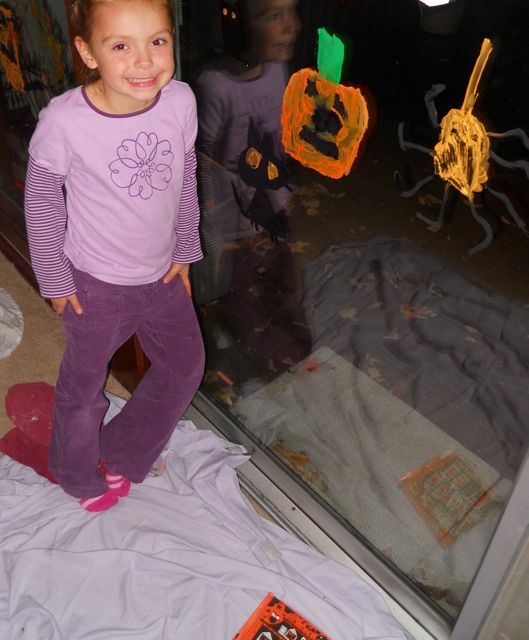 The house has been decorated with bats, jack o'lanterns, and spiderwebs for a few weeks. Candy that was supposed to be for trick or treaters has dwindled to just a few bars. Costumes have been finalized for the big day. However, I still had one more trick or should I say treat to turn up the excitement for Halloween. 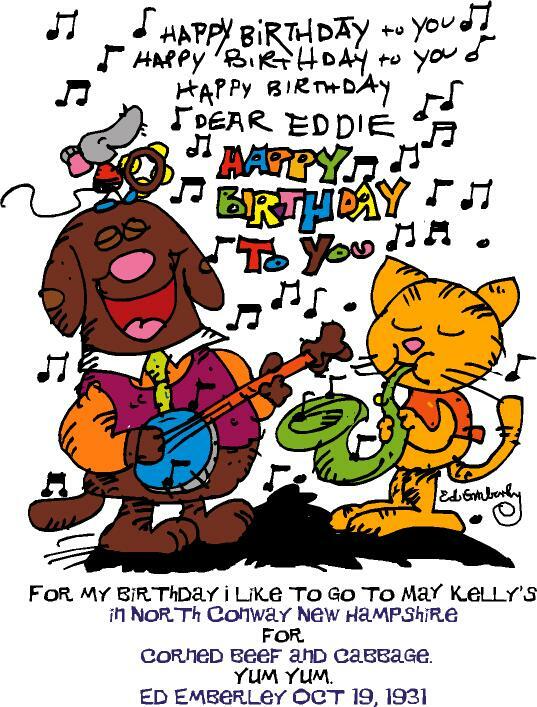 Last year, we fell in love with Ed Emberley's drawing books when we celebrated his birthday. The step-by-step illustrations allowed my children to draw objects that they would have otherwise thought too difficult to try. I remembered enjoying Ed Emberley's Halloween Drawing Book that is full of lessons on how to draw skeletons, owls, witches, and other creatures. 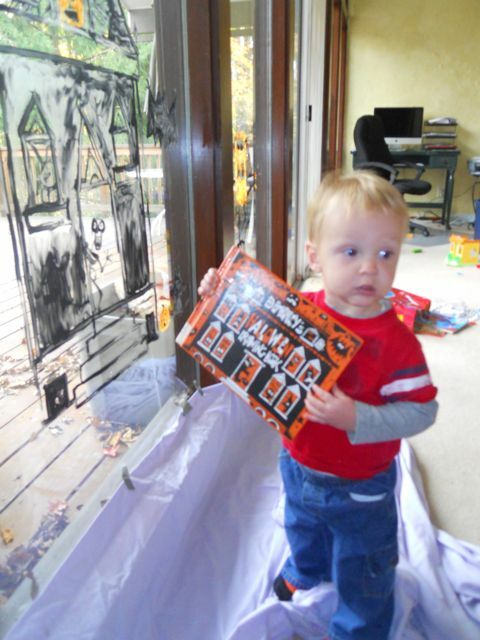 Our new house gave us the perfect canvas for celebrating Halloween with paintings inspired by Ed Emberley and this book. 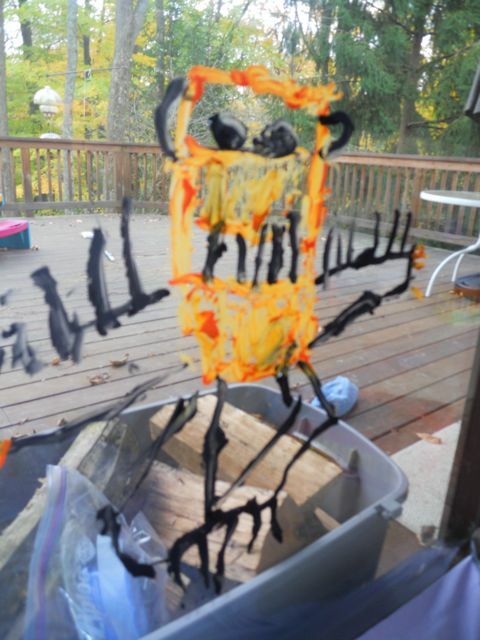 My son chose to paint a Frankstein on our sliding glass doors. We used Tempera paint and made sure to cover the floor with a sheet to catch any paint drips. I held Ed Emberley's book for my son while he worked. He was quite proud of his Frankenstein. My favorite thing about Ed Emberley's drawing books is that they provide a foundation for creativity. You will find that it is easy to make additions to make the drawing your own. My son added spikes to Frankenstein's shirt which was not in the step-by-step directions. My youngest was napping when we completed this activity. 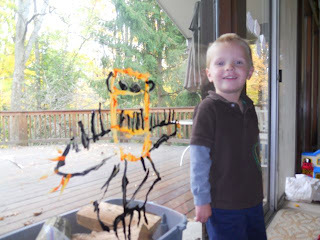 However, when he woke up he was so excited to show me the skeleton (aka Bony Legs) and pumpkins in my painting. 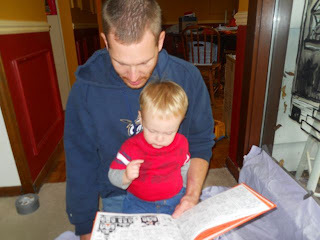 Then, we had to find all the pumpkins and various other spooks in the book. 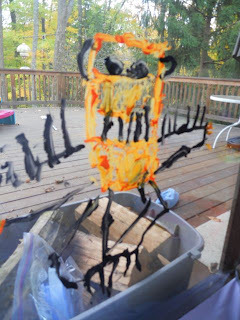 My daughter added her own paintings after dinner since she had been at school during the day! I am so happy she was able to participate in this birthday celebration. She said, "I don't even need the book anymore to do my drawings." 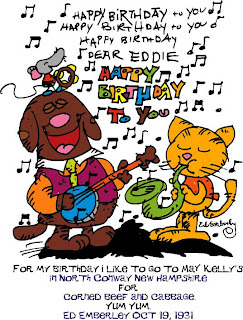 Last year, I received a birthday message from Ed Emberley that was not received in time for the birthday post (however, I did post it separately.) I wanted to share it once again since I was so grateful that he took the time to send it to me. 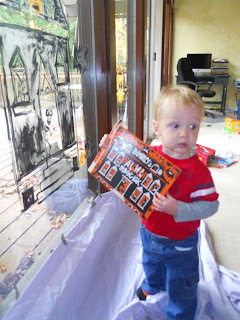 If you liked this Ed Emberley birthday celebration, check out last year's celebration where we made Halloween Thank You Notes. Two Thumbs Up! Way Up for Ed Emberley's Shake and Make App for iPhone! 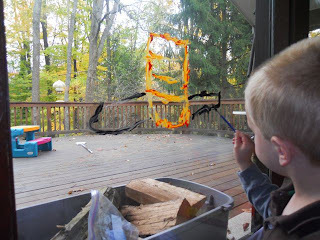 I love the idea of painting on the windows! Me, too, Eric. I love how you encourage your kids to be as creative as they like. That is one freakish Frankenstein. Very nice! Thanks for the comments. 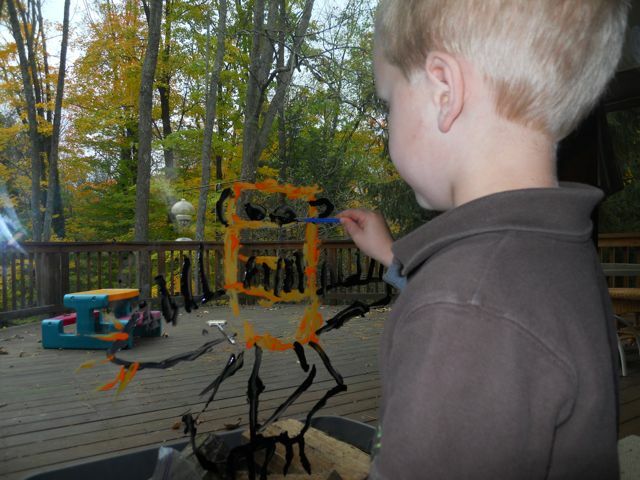 Claudine, my son was excited to hear that you liked his Frankenstein.